“The Bonds of Patrimony: Cervantes and the New World” (1994). MLN 105, March 1990, pp. 283-302. 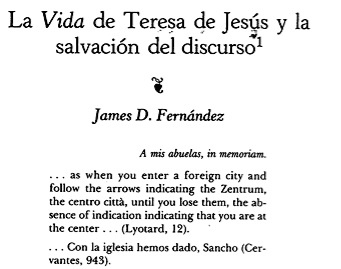 James D. Fernández (Brooklyn, NY, 1961) received his AB from Dartmouth College in 1983 and his MA and PhD in Romance Languages from Princeton University (1985, 1988). He taught as an Assistant (1988-1994) and Associate (1994) Professor at Yale University, before joining the faculty of NYU's Department of Spanish and Portuguese in 1995. He served as the founding Director of NYU's King Juan Carlos I of Spain Center from 1995-2007.